Android smartphones are programmed using Java using the Eclipse IDE. As you all know, I am somewhat of a Java buff myself and I love Eclipse and all the Java opensource ecosystem. The application itself is not very complex yet I had to spent a few days to understand how Android deals with user interface layouts (DroidDraw helped a lot) as well as with the built-in SQLite database. Who knows? When I bought my Amiga 500 around 1988, it came in a box on which was written “Your Imagination is the Limit” and this really made me understand how malleable and powerful a computer can be when programmed correctly. I am really looking forward to learn how to develop more powerful Android application. 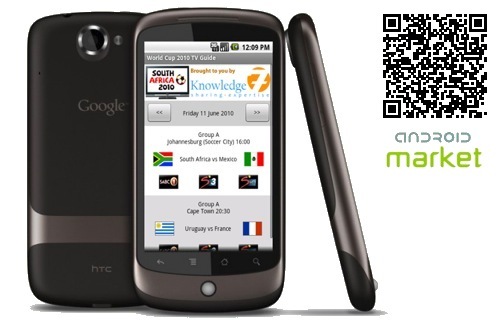 In the meantime, download “World Cup 2010 TV Guide” in the Android Market. And have fun with it!